I was amused, but pleased, to have my novella, “Lord John and the Plague of Zombies” recently nominated for an Edgar award by the Mystery Writers of America, for “Best Short Mystery Story” of 2011. Given that that particular story is not exactly a mystery, and certainly isn’t short [g], I didn’t really expect to win (which was a good thing, since I didn’t), but certainly was flattered to be nominated. 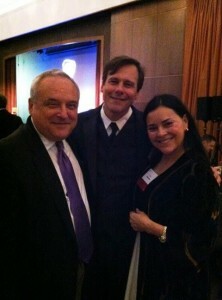 And I did have a tax-deductible reason to go to New York (for the awards dinner), where I had the double pleasure of seeing my husband in his tux (he wears it about once every three years) and of meeting a number of mystery-writing friends that I see too rarely. Among these was the talented Rob Byrnes, who writes gay crime caper novels (there’s a niche-market for you…). I’ve known Rob for years, and have read and enjoyed several of his books (I’m not sure, but I think I appear as a mention in one of the early ones—I was in the first draft, at least…). Think Donald Westlake with good dress-sense. 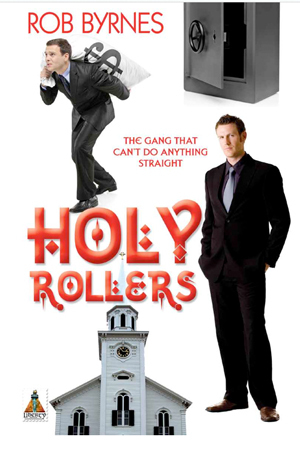 His latest is HOLY ROLLERS, in which The Gang That Can’t Do Anything Straight sets out to steal $7 million dollars from the Virginia Cathedral of Love. AND there’s my good friend Robert Dugoni, whose publisher has just this minute launched a wonderful promotion for his books, with his bestseller MURDER ONE available as an ebook—as of today—for $1.99. Bob writes prose as taut as a trampoline, and has plots like an octopus running an obstacle course. If thrillers are your thing, I strongly recommend him. Thanks, Diana. I don’t know if you have read or suggested All Cry Chaos by Leonard Rosen, but I thought it was very good. Thanks for the tip! Heads up to my fellow Kobo e-reader users, the $1.99 special is also available at kobobooks.com, even though the publisher doesn’t list it on the promo page. I always take your Methadone List seriously as what should I otherwise think? My favorite writer recommends a good book. Why shouldn’t I listen to her? Thank you very much for publicizing books that you feel your readers would like. Is it only available for $1.99 in the US? I checked Amazon and it’s $10.54 and iBooks is $8.14 or something. I wish I would have been able to sneak into the Edgar Symposium. Will you be back in NY soon? I am dying to meet you and can’t wait for your next book. I’m trying very hard not to go anywhere much this year, so I can finish the next book. [g] Hope you’ll enjoy it! Diana, I vaguely remember reading the origins of LJG’s title in one of the books. Can you tell me which book that is? Have Murder One on my Kindle and plan to start it later this pm. We’re out in our shakedown trip with our popup and I’m getting bored!!!! On your M L recommendation I’ve become a fan of Phil Rickman’s Merrilee Watkins series.Thankyou. Please try Imogen Robertson -Instruments of Darkness.But not too much distraction please! I just checked the Kindle store, too, and could only find it for $10.54. I love Diana’s recommendations, though – have found a number of authors I never would have tried otherwise. It’s funny you mention gay crime caper novels as a niche market. I have a HS classmate who writes & has published lots of gay horror fiction (Rick R. Reed). I always thought that a very niche market. I am just not into horror. But the description of both of these books you mention prompted me to download the Kindle version for my iPad. Thank you. I decided to download the software for Mac OS X 10.6 and try it out before buying a Kindle. The software won’t work! I’ve downloaded it three times and am very frustrated. When I select “Sync and check for new items” from the menu it doesn’t work, it “times out” (fails to register). If the Kindles themselves don’t work any better than the software for them then I have no use for buying a Kindle. I’ll just eat the cost of $1.95 that I paid for Custom of the Army. I really want to read your novella but customer service (on the telephone) can’t seem to solve the problem. I am needless to say very frustrated and thought I’d post this looking for a little sympathy. As one of your many fans I’ve ordered all books including anthologies from amazon.com and this is needless to say the only frustrating experience I’ve encountered. amazon.com talked me through accessing the book through some online program called “cloud reader.” I’m still not a “registered user” but apparently can access books via “cloud reader.” No matter. I’ve got “Custom of the Army” and after all the hassle am not going to try going through “cloud reader” again as it doesn’t appear to give me access to two online freebies and so I’m not foolish enough to buy another Kindle book. I got *the one* I wanted and am now reading it via “cloud reader” and am not going to shut down my computer or quit my browser (Safari) until I have finished reading “Custom of the Army.” Whew. What a mess. As previously noted I tried downloading the Mac Kindle software three times and tried dozens of times to “register” my Mac and use their software (dozens of tries). I caution all Mac users to approach using the Kindle software with caution and learn from my example. I can now access “Custom of the Army” through the available (only through the browser, not the Kindle application) and am a happy camper but I will *not* be buying any more Kindle books until if/when I decide to buy a Kindle (and am leery of that with all the frustrations I’ve had with amazon’s software). “The Custom of the Army” was a great read and well worth all the struggle I went through to it. Thank you, Diana, as always, for giving us such interesting prose. I took advantage of your blog posting to download Rob Dugoni’s book, MURDER ONE, to my Nook and within 30 pages, was hooked! I went online and downloaded three (I think?) of his earlier David Sloane books in anticipation. However, I’m so involved with THIS book, I don’t want to stop reading just to go back and read the previous books for the back story on Sloane! Thanks for recommending another great book.